When the Wrapper link is selected, it expands to display the Wrapper layout. This is used to show an external web site inside a page in your web site, using an HTML IFrame. The external web site is contained inside the Wrapper. You can navigate to different pages in the wrapped web site, all inside the page of your web site. 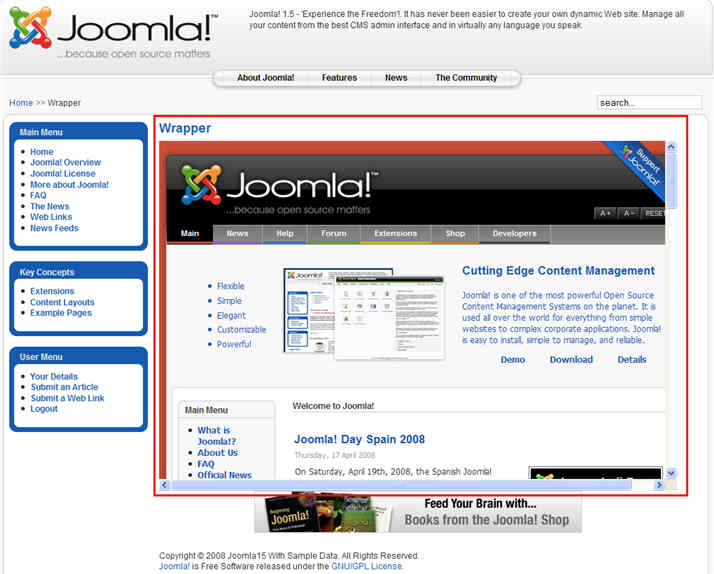 The example below shows the Joomla! web site inside a Wrapper. The Wrapper Layout has the following Basic Parameters, as shown below. Wrapper URL. URL for the web site to open inside the Wrapper IFrame. Scroll Bars. Whether or not to include horizontal and vertical scroll bars. Auto will add the scroll bars automatically when needed. Width. Width of the IFrame Window. You can enter in a number of pixels or enter in a percentage by including a "%" at the end of the number. For example, "550" means 550 pixels. "75%" means 75% of the page width. Height. Height of the IFrame window, either in pixels or percent (by adding "%" to the number).